The club was back in action the following year with a new determination which is well shown in the report below. “Never again!” was the unanimous opinion of ten sweat-stained and weary runners at the end of last year’s unsuccessful attempt by Aberdeen AAC on the John O’Groats to Land’s End Relay record. However with the usual unpredictability of the athletic animal, ten of us, along with drivers and officials found ourselves heading north on Friday 6th April in the new familiar Commer Highwayman Motor Caravans. As the rain and wind buffeted the convoy, there were no more than the usual recriminations and from the drivers, clear indication that they considered us ‘off our heads’. However our sponsors, Aberdeen and District Milk Marketing Board, had been exceedingly generous in the financial outlay, and we were determined not to let them down. Saturday, 7th April dawned cold and clear, with just a hint of snow showers in the surrounding Sutherland hills, but the gale had blown itself out. It was decided that the order of running would be : Peter Duffy and Derek Bisset; Alistair Neaves and Martin Walsh; Alastair Wood and Rab Heron; Steve Taylor and Colin Youngson; Innis Mitchell (an Aberdonian ex-Scottish Schoolboys cross country champion who was to win ‘blues’ from both Strathclyde and Glasgow Universities) and Joe Clare (Royal Navy and Blackheath Harriers stalwart who had run 2:18 for a marathon after starting seriously in athletics with the Aberdeen club). This year the Time and Distance schedule had been computerised, and another innovation was the route deviation over the Forth Road Bridge, which saved a few miles. The routine was as before, with four vans on two hour stints and one van on one hour only. At 12 noon Pete Duffy set off with a fresh wind at his back. An hour later – disaster. Derek Bisset cut his foot during his stint and was to be a passenger for all but a few miles of the whole run. A quick re-organisation and Teams Four and Five were amalgamated to form a three man team. The result of this was to reduce the rest period between runs to a desperate six hours. However the spirits remained high, and the first 100 miles, including the crossing of the snow covered Struie Pass, were completed approximately 25 minutes inside the schedule which was based on a time 13 minutes inside Reading’s record. The next mishap occurred at Inverness, when a breakdown in communications resulted in a van failing to link up; consequently the combined team were four hours on the road, followed by two and a half hours by Van 2. By now it was snowing fairly steadily, but the underfoot conditions were quite good. By 11:00 am on Sunday, the runners were going through Perth and still pulling up on schedule. On the approach to the Forth Road Bridge there was a bitterly cold wind blowing down the Firth. The end of Princes Street in Edinburgh was reached in an incredible one hour twenty minutes ahead of schedule. It was here unfortunately that Van 1 had an argument with a pedestrian barrier and was to be out of commission for the remainder of the run. Nine sweaty bodies were now squeezed into the remaining four vehicles, not without the usual grumbles – all good natured, of course! Further south on the stiff climb to the summit of the Devil’s Beeftub the pace was maintained, but the runners were now preparing to enter their second night with the daunting prospect of crossing a snow covered Shap in the early hours of Monday morning. By Gretna the team was one and a half hours up on the schedule, and this was the high point of the run. The conditions on Shap were worse than we at first feared and a temperature of twelve degrees below freezing began to take a heavy toll on tired legs. By the change-over just outside Kendal, the time on hand began to dwindle and from then on it was to be a battle of sheer guts to keep ahead of schedule. Later we learned that it had been the coldest April night in the area for 50 years! The third day brought its inevitable problems, and despite the bright sunshine the average was dropping drastically; a situation further aggravated by a five minute wait at a bridge on the Manchester Ship Canal. As the runners swung off the main road just south of Hereford, the gain on schedule was now a perilous 31 minutes and the worst of the night was yet to come. By the Severn Bridge there were still 210 miles to go and things were beginning to look black. By Crediton on the final morning – the low point – the schedule showed that we were now 20 minutes behind the record and with only 116 miles left it was hurriedly decided to make a drastic change in tactics. Two teams (one of four runners and one of five) were quickly organised with each man on a very short stint. As Okehampton was reached, the watches showed that the rot had been stopped, and in fact a few precious minutes had been pulled back. By now with 97 miles to go, and in bright sunshine, weary limbs began to take on a more springy action, and as the two teams changed over on the steep climb out of Okehampton, there was a decided air of optimism spreading through the whole party. 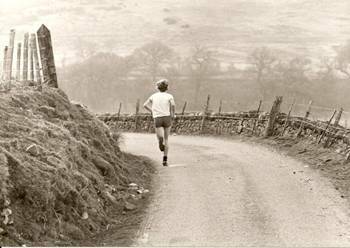 By the 800 miles point, just south of Bodmin, the 5 minute 3 second per mile pace of the last 60 miles had pulled the red and white vested Aberdonians back on to their schedule, and it now became apparent that the record was going to be beaten. The distance done by each runner was now little more than a glorified sprint, and hills were easily demolished in this way. Local news bulletins had alerted the population to the success of the ‘Northern Invaders’ and the flashing headlights and the honking horns provided the extra incentive to get to the finish. At 7:05 pm the four men on the road together were joined by the remainder of the team, who joined hands and did a delighted jig over the line to the strains of Amazing Grace played on the bagpipes by co-ordinator Gordon Casely. It was a proud moment for the Aberdeen club as referee Bill Donald announced the time – 79 hours 8 minutes 8 seconds. Almost 32 minutes inside the previous record. notes for a brief epic novel of pedestrianism on the High Road (and other sundry places in South Britain) in the company of disreputable Coachmen and Sundry Footpads and Broken Men. · Great Meaning but no purpose. · Good at the beginning; good at the end; a bit of a drag in the middle.